Strange as it may seem, also high in the mountains there is a tsunami risk. In the Alps, various event can trigger a tsunami, like earthquakes, landslides or glacial lake outbursts. The 1806 tsunami of Lake Lauerzer (Switzerland) was caused by a large landslide and killed almost 500 people. 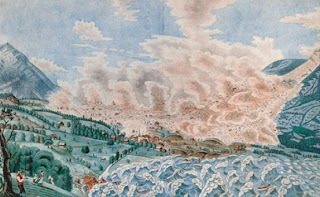 Painting of the 1806 tsunami of Lake Lauerz made by David Alois Schmid, who observed the disaster from his hometown Schwyz. In September 1601 an earthquake hit the area of Lake Lucerne. The 5.9 magnitude earthquake triggered both an underwater landslide as a rockfall from the nearby Bürgenstock mountain. The resulting wave was almost four meters high and inundated "a thousand steps" (50 to 100 meters) broad area around the lake. Eight people were killed. In 1867 a second wave caused widespread destruction. As no earthquake was recorded before the tsunami, experts believe that the collapse of lake sediments and an underwater landslide caused the wave. In October 1963 the entire slope of Mount Toc in the Italian Dolomites collapsed. 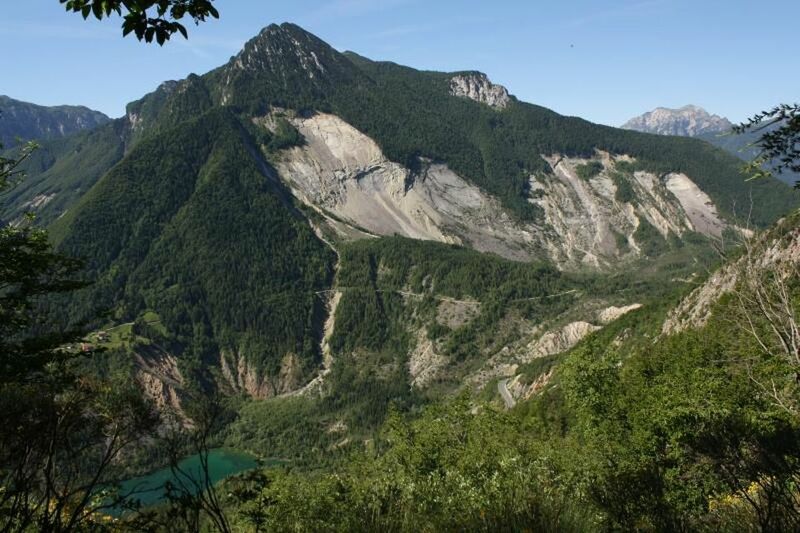 Within 30 to 40 seconds estimated 240 to 270 million cubic meters of rock plunged into the reservoir of Vajont, filling the 400 meters deep gorge behind the dam. The wave generated by the impact of the landslide traveled 140 meters up on the opposite shore, reaching some buildings of the village of Erto. At the moment of the impact,the reservoir contained 115 million cubic meters of water. The landslide pushed part of the water out of the lake, producing a wave with a maximal height of 230 to 240 meters. A 100 to 150 meters high wave rushed into the gorge of the Vajont, in direction of the larger and inhabited Piave valley. There the wave destroyed the villages of Longarone, Pirago, Villanova, Rivalta and Fae, and in less than 15 minutes more than 2,000 people were killed. Glacier outburst floods (GOF) refer to the rapid and sudden discharge of water from within a glacier or from an ice-dammed lake. In the Alps and Cascades most outburst floods occur in the summer, when the melting glaciers provide large quantities of water. In the Andes and the Himalaya also another type of floods is common, outbursts from moraine-dammed lakes, referred to as glacial lake outburst flood (GLOF). Floods resulting from moraine-dam failure have been increasing in frequency in the Himalaya over the past 70 years. One of the best-documented examples happened in August 1985, when the terminus of the Langmoche Glacier in the Khumbu Himal collapsed into the Dig Tsho glacial lake, triggering a wave overflowing the moraine. The wave destroyed a power plant and five people were killed. Laguna Paron (Cordillera Blanca, Peru) in 2009, a lake dammed by the glacier Hatunraju with a capacity of 75 million cubic meters. The lake is surrounded by a 250 meters high moraine. If this dam fails an outburst of around 50 million cubic meters could flood the valleys downstream. 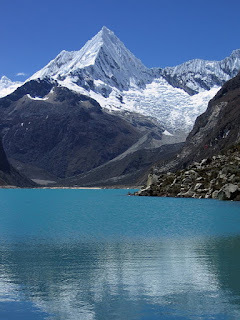 The worst glacial lake outburst in historic time was caused by the failure of such a moraine-dam in Peru, when in December 1941 the town of Huaraz was partially destroyed by a flood, 60.000 people were killed. My name is Lauralee, and I'm working on a National History Day project on D-Day. I read your article published on Forbes about the geological influence of the landing in Normandy, and I was wondering if it would be okay if my group and I could ask you a couple questions (email, phone, what ever suits you best!) about the geological effects of D-Day. We really want to address the geological angle of war since it is an overlooked aspect of war, and I personally think you have some really interesting angles on Normandy! Let me know if you need my email for further correspondence! Yes! Thanks so much for your reply! I just sent you an email. I'm looking forward to hearing your perspective of D-Day!